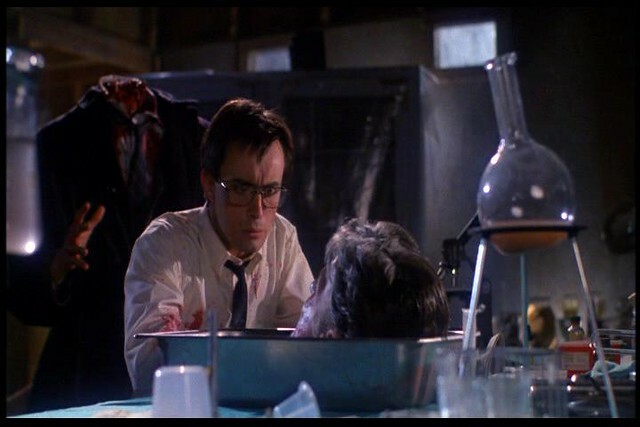 Today I’m going to talk about the 1985 cult horror film classic, Re-animator starring Jeffrey Combs and Barbara Crampton. I have seen this movie previously. I watched it numerous times during my Fangoria “horror” phase. In the late 80s-early 90s I was a “gore hound”. I loved splatter films. Friday the 13th, Nightmare on Elm Street, Evil Dead. All of them. Fangoria was my favorite magazine and it clued me in on many other awesome horror movies that were out for me to rent on the burgeoning VHS rental market. This was one I discovered in the pages of that awesome magazine. 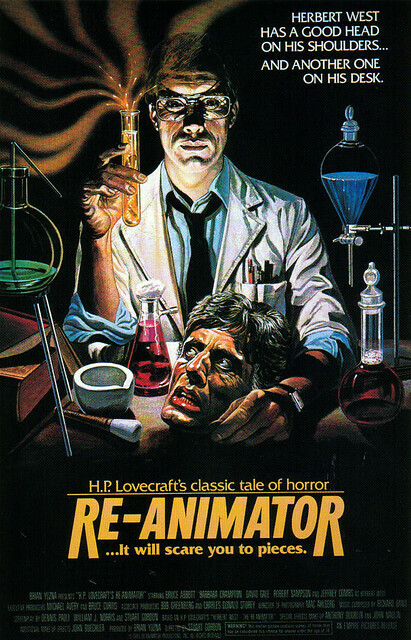 Re-animator is based on the original Lovecraft short story, Herbert West – Reanimator. It’s not a direct adaptation, though. The movie takes many of the characters and some of the situations and re-imagines them a bit. While the Lovecraft story is sort of an homage to the original Shelley Frankenstein, the movie is a parody of both the Lovecraft and Shelley stories. It takes the elements of horror and the macabre from Lovecraft’s story and infuses much dark humor into the situations. Some might think that this movie doesn’t fit into the traditional “zombie” genre. Herbert West is re-animating the dead, so his creations are, in effect, zombies. Though maybe not the mindless brain-eating zombies popularized by Night of the Living Dead and Return of the Living Dead. You could probably also throw this movie into the “mad scientist” genre. The plot revolves around Herbert West. Newly arrived at the Miskatonic University medical school. He rents a room from Dan Cain, student and boyfriend to Megan, the daughter of the medical school dean. Things start going awry when Dan discovers that Herbert is performing medical experiments with a brand new serum he’s invented for bringing the dead back to life. Dan and Megan are drawn into Herbert’s deadly machinations as the bodies not only begin to fall, but continue to rise up again. I can see the elements of Lovecraft’s story that were re-imagined as I watch this movie. Herbert constantly wanting fresher dead bodies, Dean Halsey becoming a zombie and being institutionalized and reanimating a head separate from the body. Now that I’ve read the story it’s cool to see this in the movie I know so well. The story in this movie covers roughly the first two parts of Lovecraft’s story. As the movie started, I was sort of surprised at how blatantly the score rips off Herrmann’s Psycho score with the violins. And, for what is essentially a B-grade horror movie, the effects hold up fairly well. And while the acting is understandably, not great, the performance of Jeffrey Combs as Herbert West is nothing short of awesome. He plays the role with such earnest seriousness it makes the craziness all around him seem that much more crazy. This film is sort of famous for the “head” scene later in the movie (you should know what I mean). And it’s every bit as awesomely weird and crazy as I remembered. So, yes, this film still holds up pretty well for me. I enjoyed watching it again. The film did well enough that it got like three sequels. I haven’t watched any of them. However, the title of the first sequel should clue you into how much of a Frankenstein parody this series really is; Bride of Re-animator. This entry was posted on October 11, 2013 at 8:00 am and is filed under 80s, Halloween, holiday, monsters, movies, pop culture, zombies with tags AWESOME-tober-fest, AWESOME-tober-fest 2013, Halloween, HP Lovecraft, monsters, movies, pop culture, reviews, zombies. You can follow any responses to this entry through the RSS 2.0 feed. You can skip to the end and leave a response. Pinging is currently not allowed.